Proprietors Terry & Anne Brookfield. Bromac Nursery was established in 1990 on a site adjacent to the Shropshire Union Canal less than half mile from the village centre. 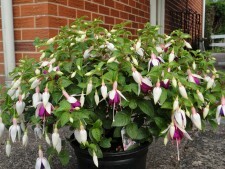 We specialise in growing Fuchsias and have won gold medals at major flower shows. We also grow bedding plants and hanging baskets.